So far in GIS Basics, you've learned a little about just what GIS is, what goes into it, and how it works. In this section it is important to explain what is not a GIS. There are three things that are associated and very related to GIS, but are, NOT, by themselves a GIS. Below are the three things most commonly confused with GIS. While all three of them are strongly related to GIS, each of them is a separate and distinct spatial tool of its own. A Global Positioning System (GPS) is a tool used to collect data for a GIS. Many people get the terms GIS and GPS confused with each other. GPS stands for Global Positioning System, which is a system of satellites, ground stations, and receivers that allow you to find your exact location on Earth. By collecting location points you can begin compile datasets that can be used to map whatever data you are collecting. The U.S. Department of Defense was one of the first to use GPS technology as a navigation system. Not long after, biologist's, foresters, and transportation departments to name a few, caught on to this revolutionary way of precisley collecting data. How GPS's and GIS relate to one another: The way a GPS works is, by connecting to three or more 24 GPS satellites that orbit 11,000 nautical miles above the earth, and are monitored by ground stations located throughout the world. GPS systems generate geographic reference points in the form of latitude, longitude, and elevation coordinates. Once the data is collected it can be put into a GIS and displayed digitally as it is in the real world. The technology has advanced greatly over the past ten years. Today boats and many car manufacturer's have GPS units mounted so they can track where they are at all times. The increased availability and affordability of handheld GPS units, makes it useful for the average person to use for activities such as backpacking, hunting, and skiing, to name a few. We're all familiar with maps. They help us locate things, help us get from place to place, and give us a sense of what places are like. They help us see and learn about where we're at, where we've been, where we'd like to go. Maps also provide us with glimpses into the past, of the places and journeys that people before us experienced. They are a form of visual communication, a way of showing, displaying, or representing the spatial relationships between different places and their features. Like other forms of communication, maps vary greatly in their purpose and style, from a rough diagram you may draw on a napkin for a friend to get to your house, or to a complex city map. How Maps and GIS Relate to Each Other: Maps alone, regardless of whether they are finished paper versions or in digital format are not necessarily a GIS. Though they all have geographic data, which is a big part of GIS, they may not have the geographic information behind them. This is simply a map of Pennsylvania's county boundaries. There is not any other information other than what you see. 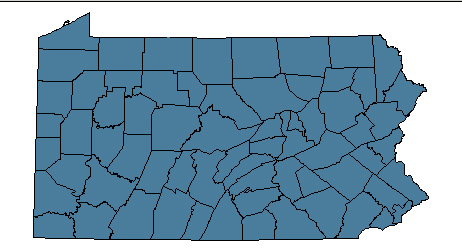 When a map is put into a GIS and linked to other data sources, you not only get the map of Pennsylvania's County Boundaries but you get the information or attributes of the counties. 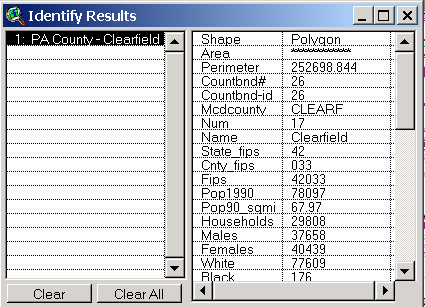 Clearfiled County is selected in the example to the below. When the data is in a GIS, information about the Clearfiled such as the population, number of households, the number of males and females is easy to access. Buying GIS software and loading it on a computer does not mean that you instantly have a GIS. GIS's also require data, people, and manipulation. The trained user is able to make a GIS powerful by asking questions, linking to complex databases, and layering data in a intelligent manner. As mentioned before, complex questions and problems can be answered when using a GIS.